Tom's been telling anybody who would listen about Chinese hog farmers being hit with one of the worst outbreaks of African Swine Fever (ASF) in the country's history, and after hog futures finally caught up to the story - rising over 50% in March as pointed out by TT's Patrick Rooney - it's time we hear what's going on in China. Who's Tom? Tom is Thomas Chavez of Alternative Capital Advisor's Strategic Ag program, who put up a 16% number in March (past performance is not necessarily indicative of future results) based in part on his call on the hog markets, which he believed were underpricing the risk of African Swine Fever severely curtailing China's domestic supply. ASF is highly contagious -as in if 1 or 2 of your pigs show symptoms, you'll have to get rid of your whole lot kind of contagious - and there's no vaccine on the horizon. In fact, Spain was hit with this very same swine fever in 1960 with a slow spread peaking in the 1980s. It took almost 35 years to eradicate the disease in-country, as Spain was finally declared ASF-free in 1995. What we learned from ASF in Spain, is that the disease never presents itself the same, and the effort to eradicate the disease is high. 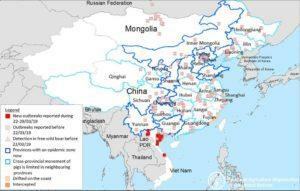 And now, ASF is showing up in the largest pork-consuming country in the world, China. 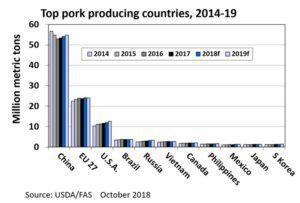 China accounts for just below half of the world's pork production and is also the top pork importing country. Basically, China consumes a lot of pork. (For reference, the U.S. produces ~74 million pigs while China has 450-500 million; also, check out these "high-rise hog hotels" in China). Some are predicting ASF in China could erase anywhere between 20-40% of pigs in China, which means there will be a huge deficit between supply and demand in the country. In America, hog production is highly industrialized, and it's easy to get an estimation of how something like ASF would affect our hog production and much easier to control the disease, but in China, a lot of hog producers are still mom and pop farmers that live in close proximity to one another, both making it easy for it to spread while at the same time hard to control the sickness and estimate the possible effect. 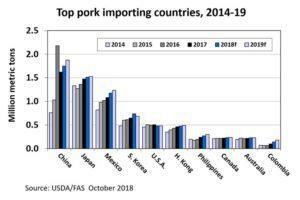 The price move was the American pig market finally pricing in some of this risk, as China will be pulling from American pig-producers to meet demand. In fact, China already sort of saw this coming as a possibility, as in 2012, China bought the world's largest pork producer, Smithfield Foods, for $7.1 billion. There are two hog-producers, one on the west coast and one on the east coast, that will be taking approximately 22,000 hogs/per day and shipping them over whole-carcass to China. So how is this going to affect the American market? 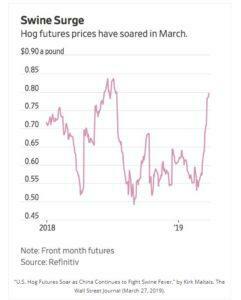 Well, in the short-term, there's already been a spike in lean hog prices, but we could see a lot of other markets make sympathetic moves. Grains, for example, have been tough in recent times, but the longer and larger the issues are in pigs may be the catalyst to give the ag market the volatility it desperately needs (something covered in RCM's 2019 outlook). All things being equal, the bean and corn market will more than likely be hurting too, big supplies, and less pigs, means oversupply. I always get asked the question of why it was so difficult to position for the trade. And I think the answer there is that there were a lot of bearish fundamentals going on at the same time, like a record supply amount. Hog traders were majorly concerned about big supply & tariffs in China and Mexico cutting off demand for US pork, so you had this sort of classic market fight between big supply and a big (but not yet known how big) demand problem out of China. I think if you were focused on supply only, it was easy to miss the boat. Another issue is that info coming from China is opaque, so it's hard to trust the data. 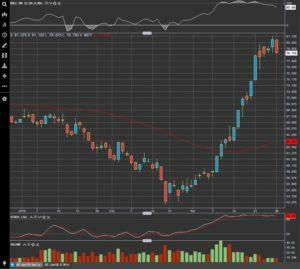 Overall, I think this could bring in a wild few years in the ag markets. The long-term impact of this disease could last for years as the breeding her (60 million sows) is being liquidated, which by the way is equal to the entire breeding population in the U.S. This could create a long-lasting pork shortfall into 2020. Benchmark index performance is for the constituents of that index only, and does not represent the entire universe of possible investments within that asset class. And further, that there can be limitations and biases to indices such as survivorship, self-reporting, and instant history. Investors interested in investing with a managed futures program (excepting those programs which are offered exclusively to qualified eligible persons as that term is defined by CFTC regulation 4.7) will be required to receive and sign off on a disclosure document in compliance with certain CFT rules. The disclosure document contains a complete description of the principal risk factors and each fee to be charged to your account by the CTA, as well as the composite performance of accounts under the CTA's management over at least the most recent five years. Investor interested in investing in any of the programs on this website are urged to carefully read these disclosure documents, including, but not limited to the performance information, before investing in any such programs.